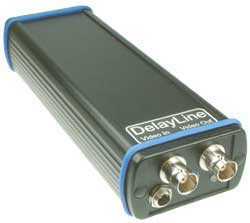 A cost-effective delay system that can hold up to 2 minutes of video and audio within its internal solid-state memory. DelayLine is ideal for applications where a constantly recycling video buffer is required such as action replay, pre-event buffer and synchronising video and audio feeds. It has been used in many diverse applications such as sports coaching, video art, museum exhibits and profanity protection of broadcast feeds.